PC cooling, chassis, and power supplies specialist be quiet! has launched a slimmed down version of its Pure Rock cooler. 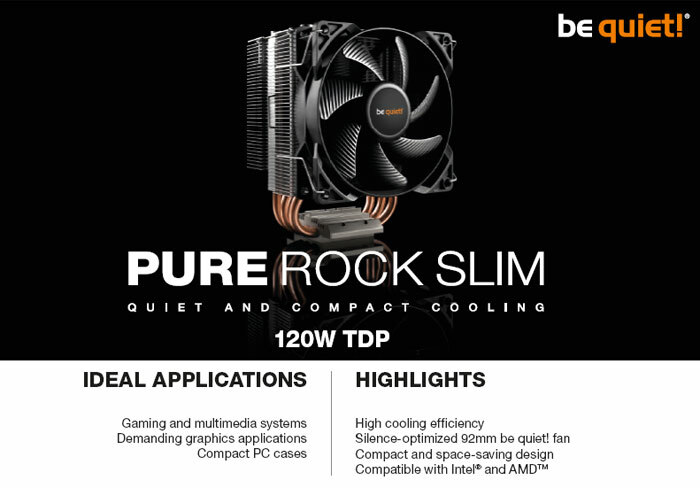 Aimed at modern PC systems with constrained space, due to either asymmetrical or compact construction, the aptly named Pure Rock Slim offers up to 120W of cooling capacity. Furthermore, thrifty folk will be pleased that be quiet! promises "an optimal price-performance ratio". The be quiet! Pure Rock Slim is based around a 92mm PWM controlled seven-blade fan. In operation the fan shouldn't make more than 25.4 decibels of noise. The fan is attached to a finned coil block which incorporates three 6mm high performance heat pipes topped by aluminium caps. Slim by name, the new air cooler from be quiet! measures 81.8 x 97.0 x 124.8mm and is said, thanks to its asymmetric design, to fit in tight spaces next to fully populated memory banks. A nicety for PC system enthusiasts is the ease of installation, which is said to be unhindered by confined spaces. Compatibility with "all current Intel and AMD sockets," is promised. 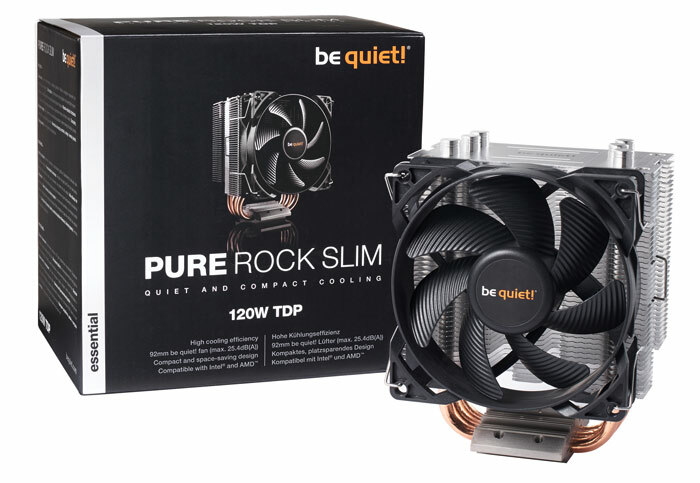 For comparison the non-slim Pure Rock cooler can cope with 150W TDP processors, has four 6mm heat pipes, a nine blade silence-optimized 120mm be quiet! PWM fan, creates a maximum of 26.8 decibels of noise, and measures a far chunkier 87.5 x 121 x 155mm. be quiet! says that the Pure Rock Slim cooler is available immediately and it is priced at €28 / $24.90 / ‎£23.99. Buyers receive a 3-year warranty. Slim? Compact? What? Seriously? Did I miss anything important in the evolution of the English language? 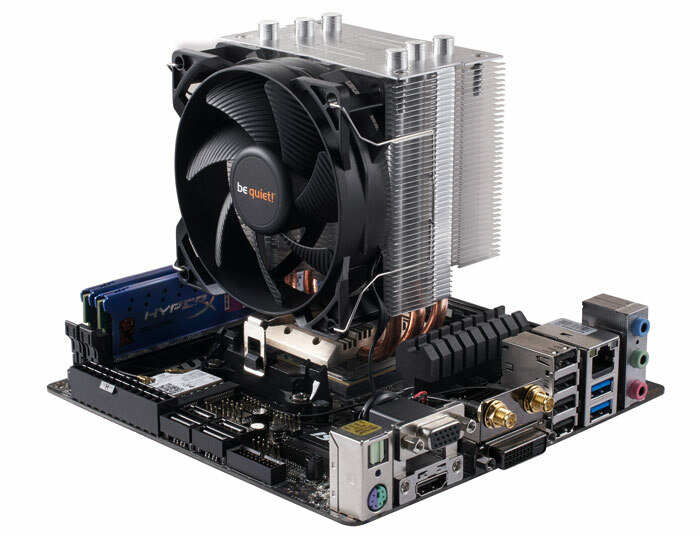 To be fair compared to this: https://www.scan.co.uk/products/be-quiet!-dark-rock-pro-3-dual-tower-cpu-cooler-7-heatpipes-1x120mmplus1x135mm-pwm-fans-250w-tdp-for it is slim! Looks great and good price, might be my next cooler for my itx build.